The chants and cheers were loud enough to seep through the locker room’s concrete block walls and pierce the steel front door, pouring out into the arena’s hallways. 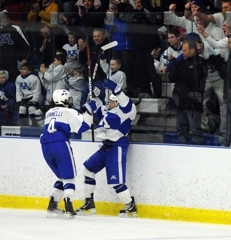 Even the post-victory jams, cranked to eardrum-shaking velocity, were no match for the buzz created by Minnetonka’s players. The unusually high decibel levels came in the aftermath of the No. 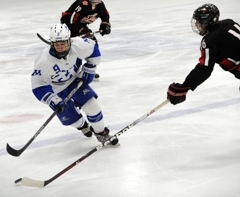 2-ranked Skippers’ 6-0 thumping of Lake Conference rival Eden Prairie, a victory on Thursday, Feb. 16, at the Pagel Activity Center that had all sorts of feel-good elements tied to it. 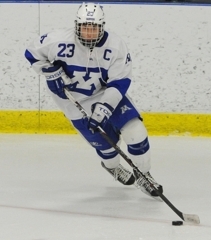 In no particular order of importance, the win avenged a 4-2 loss in Eden Prairie on Jan. 28, assured the Skippers of at least a share of the Lake Conference title and locked Minnetonka in the No. 1 seed in the upcoming Section 6AA playoffs. Was it the revenge factor that made the victory so sweet? 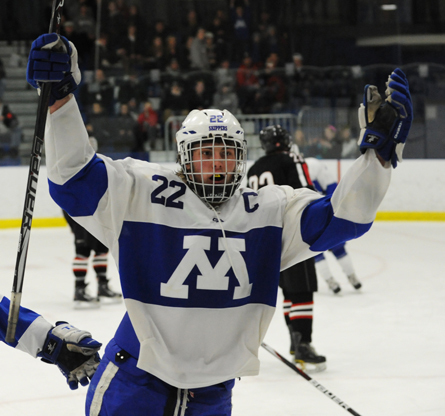 “They kind of took it to us last time at their place, so we were ready to go for this one,” said senior Sam Rothstein, who scored Minnetonka’s first two goals. Or was earning a share of the title in the state’s toughest conference the biggest reason to celebrate -- and celebrate loudly? 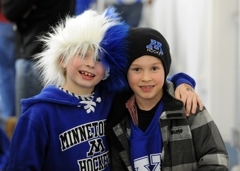 Perhaps earning the top seed in Section 6AA, generally regarded as the most difficult to navigate in the state, was the biggest cause for rejoicing? 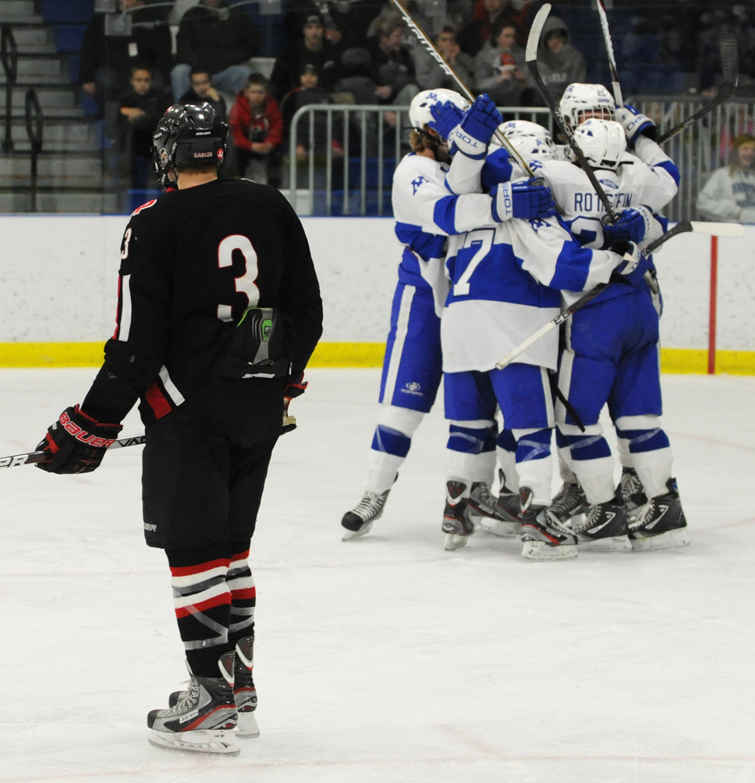 Minnetonka coach Brian Urick was pleased more by how the Skippers played than the bounty his team earned. 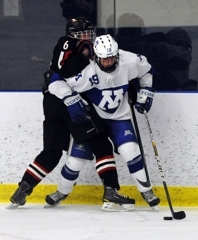 Minnetonka allowed 11 shots – including a mere two in the third period -- thanks to its suffocating defense. 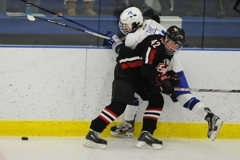 Eden Prairie’s offense also was limited by injuries that knocked its top three scorers – Andrew Knudsen (hip), Mason Bergh (broken collarbone) and Steven Spinner (head) – out of the lineup. 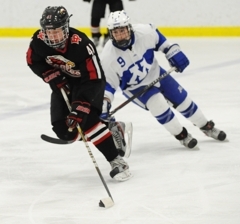 Two more Eden Prairie forwards, Brad Boldenow and Daniel Thayer, exited early with head injuries. Eden Prairie coach Lee Smith said in his 19 seasons he’s never had one of his teams impacted by injuries like the recent tidal wave that has hit the defending state Class 2A champion Eagles. “Not even close, nothing like this,” Smith said. 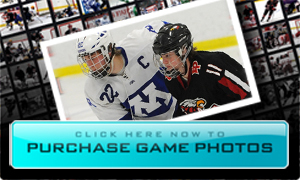 “We had one guy playing who played in the state championship game last year. So what do you expect? 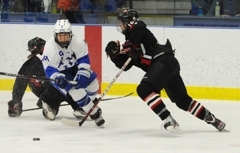 Sam Rothstein continued his late-season scoring surge by notching two goals as No. 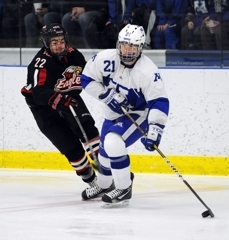 2-ranked Minnetonka took advantage of an injury-depleted Eden Prairie lineup in a dominating 6-0 Lake Conference victory on Thursday, Feb. 16, at the Pagel Activity Center in Minnetonka. The victory assures Minnetonka (21-3-0) of a share of the Lake Conference championship and the top seed in the upcoming Section 6AA playoffs. No. 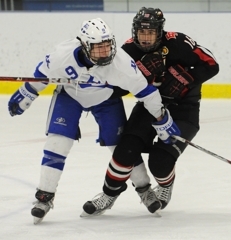 6-ranked Eden Prairie, which played without its entire top line of Mason Bergh, Andrew Knudsen and Steven Spinner and lost two more forwards – Brad Boldenow and Daniel Thayer -- to head injuries during the game, dropped to 17-6-1. The Eagles will likely get the No. 2 or 3 seed in Section 6AA. 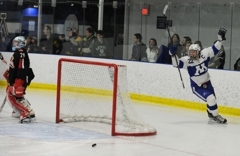 Rothstein, a senior who has 11 goals in the Skippers’ last eight games, scored the only goal of the first period, one-timing a cross-ice feed from Max Coatta into the upper left corner of the net. 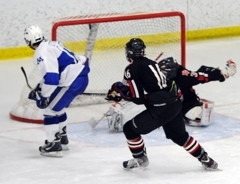 Rothstein’s goal came while the Skippers were on a 5-minute power play after a major penalty was called on Eden Prairie’s Hunter Warner for head contact. 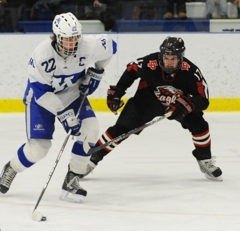 Minnetonka controlled play throughout the first period, when it had an 8-2 edge in shots but much more substantial advantage in territorial play. 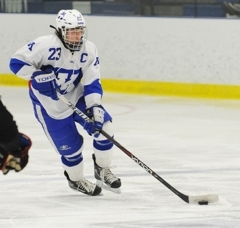 Rothstein, Michael Prochno and Erik Baskin scored goals in the second period as the Skippers took control. 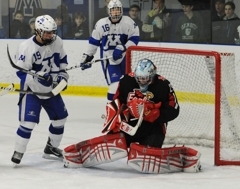 Minnetonka junior goaltender Paul Ciaccio made a handful of quality saves on the 11 shots he faced en route to the shutout. 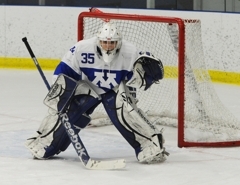 Sophomore Derrick LaCombe made 21 saves through two periods before giving way to fellow sophomore Jake Gerdes to start the third. 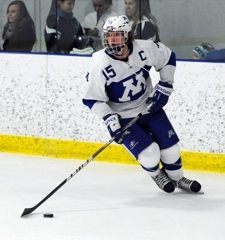 Gerdes was peppered with 24 shots in the final period, when Minnetonka’s Vinni Lettieri and Charlie Huminski scored in span of 26 seconds to force running time. 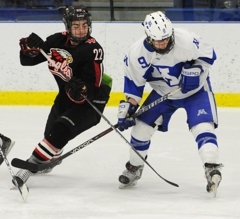 Bergh suffered a broken collarbone in the Eagles’ first meeting with Minnetonka on Jan. 28 and is expected to miss the rest of the season. 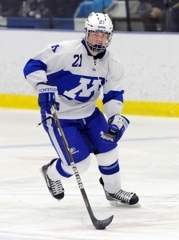 Spinner reportedly out with a head injury and Knudsen is sidelined with what is believed to be hip injury. The timing of their return is uncertain, as is the status of Boldenow and Thayer. 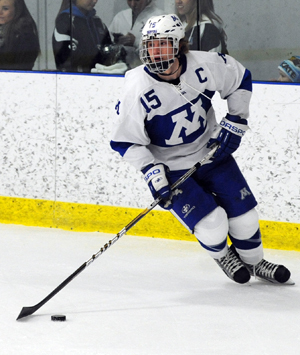 Minnetonka's defensemen typically are overshadowed by the Skippers' squadron of high-flying forwards, but when a team allows just 11 shots on goal, the blue liners have to be doing something right. 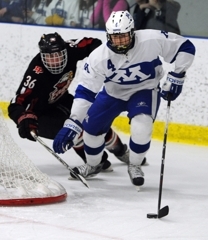 Schuldt, a hard-hitting senior who has committed to play at Michigan Tech, was part of a group that did a great job breaking the puck out quickly all night. The senior continued his late-season tear with another highlight-filled night. His two goals came off gorgeous one-timers, and he added an assist while joining Erik Baskin and Connor Thie on a dominant forward line. 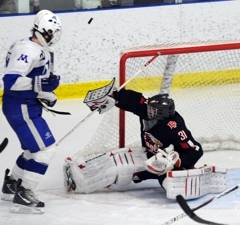 With the game still in doubt, Baskin snapped a quick shot from the high slot past Eden Prairie goaltender Derrick LaCombe with 17 seconds left in the second period. 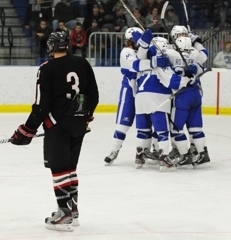 That goal put the Skippers ahead 4-0 and deflated the Eagles heading into the locker room. Baskin finished with a goal and two assists.